Website is down. Company appears to be out of business. Unethical. Debited my account again after i finished my subscription, and then never refunded. FXPro does STOP HUNTING! Beware, folks. It so often does not accept market orders when the price is moving fast. The customer support is awful. Everytime i trade, when in profits the trade won't close either you close it manually or by 'take profits'. But when your in negatives, it closes immediately. So just beware if you're thinking of using them as your broker. they are the worse brokers you can trade with. Talk about Cr**ks at the dealing desk. 100% of the time you make a trade and market is quickly moving against you you're in the trade normally instantly down 8-12 pips. WHAT Crooks when you have to go through dealing desk--will never do that again--stay away from these CR**KS!! this company and it's staff are all thieve, i started trading fx with them and recorded know profit in all my trade, please member's beware . This company is an absolute scam artist. I had not even executed one trade yet, and they kept delaying withdrawing a portion of my funds, and so then I decided just to close the account. I opened it due to an ad on Yahoo that was very intriguing, but my real experience with them was a nightmare. They refused to let you withdraw money, or find ways to delay. They also have very questionable practices, like closing out trades when the price of the instrument has fallen 5-10%, but has not even hit your stop. I personally witness stop hunting, and dealing desk intervention in your positions. Once you have a profit, constant requotes until you are loosing a substantial amount. Server disconnects, only to be reconnected later and find that your stop or t/p was missed substantially. Bursts in activity due to network lag on their end (I have business class 10Mbps-ether) and pricing off by 5-10 pips sometimes, very wide spreads. MT4 platform is ncie, but would be better with another broker, their system hunts scalpers, and anyone using automated trading mechanisms. Their staff does not speak english very well, and they have hidden fees. The list goes on, but of course, someone will read these reviews and open an account anyway, I wish I had taken the warnings seriously. 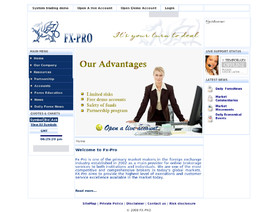 I opened a demo account with this company this past weekend mistakenly thinking it was FxPro. What a strange company! They post commisions, $2.00/mini, on the trade tab, but the net in the profit column doesnt tally correctly. Sometimes the commisions are applied, sometimes not. On the Account History tab nothing totals correctly. Horizontaly across the individual trades the quoted profit is never the same as the difference between quoted opening and closing prices, commisions are not mentioned, and its imposible to tell how they are applied. Verticaly down the profits column the total never equals the individual trade results. It is short by a major amount. Needless to say, I have deleted this demo account after three days use. Very poor accounting, no consistensy, and no logical reason. This broker is is very good, in fact one of the best at stealing its traders money.